He hates everyone else, but whenever he sees them he comes running to say hello. 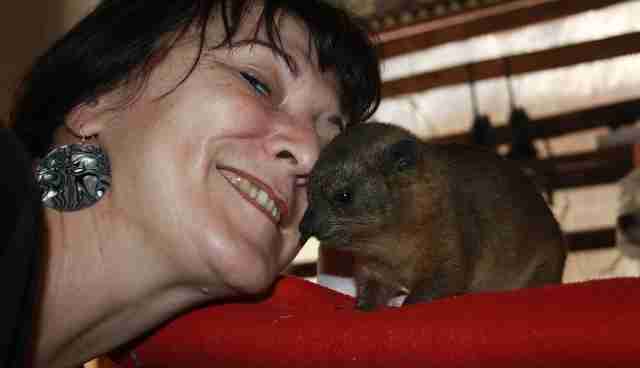 When I first saw a dassie, I thought it was a quokka - you know, one of those cute marsupials who smile for selfies. But I was in South Africa - not Western Australia, where quokkas live - so I knew this creature was something different altogether. 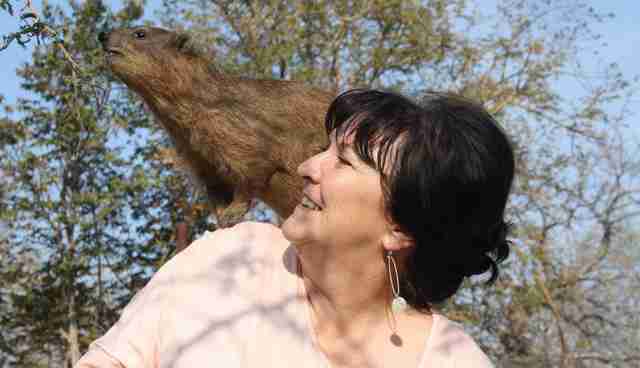 The dassie (meaning "badger" in Afrikaans) is an African rodent who lives around rocky outcrops and eats grass. They might look like quokkas - both species are small, brown-furred and have cute, round ears and black button noses. But the similarities stop there. One noticeable difference between a quokka and a dassie is that dassies have sharp, fang-like incisors. They almost look like tusks, which makes it easy to understand how dassies are actually the closest living relative to the elephant. 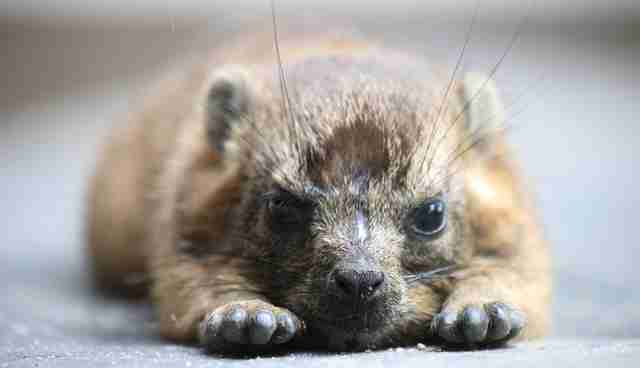 And dassies can be mean - really mean. When tourists approach them to take a photo, dassies are not afraid to bite. 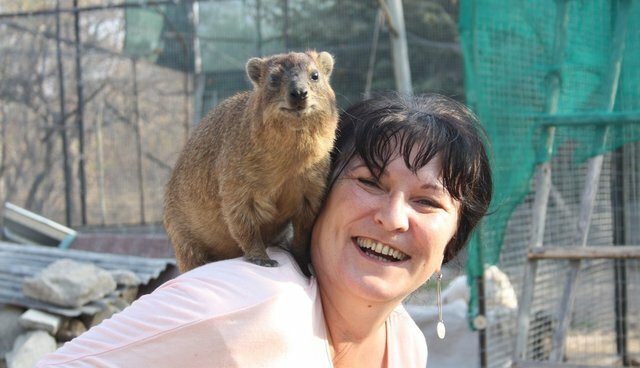 Based on the dassie's fearsome reputation, it was surprising to learn that Michele and Ian Merrifield had hand-raised a dassie named Cachou at Daktari Bush School and Wildlife Orphanage, a South African wildlife refuge and rescue organization that also teaches local children to care for animals and their environment. 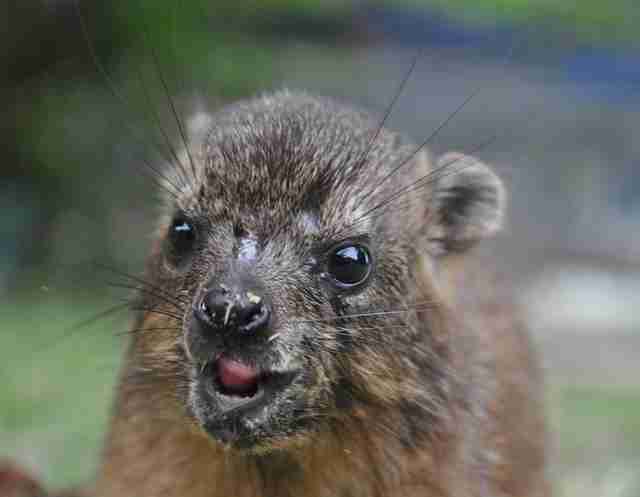 The Merrifields originally adopted 15 dassies. 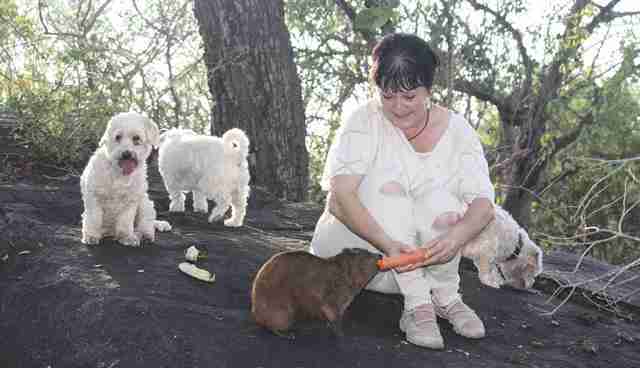 A local landowner in Hoedspruit, South Africa, was getting fed up with all the dassies on his property. Fearing he would start shooting them, Michele and Ian offered to relocate them to Daktari. 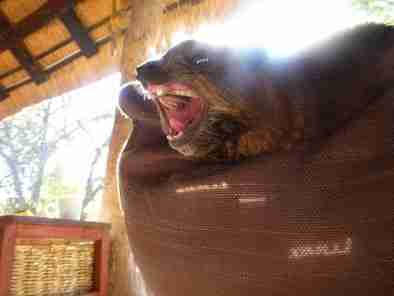 When the dassies arrived, the Merrifields placed them in a large enclosure for a quarantine period. They wanted to make sure the dassies didn't have any infectious diseases, and they also wanted the dassies to get used to the new area. 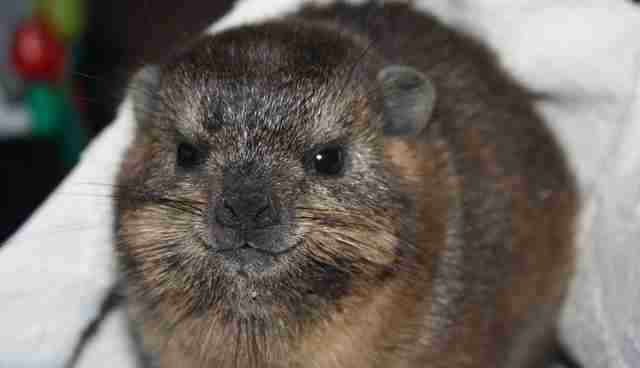 After a few months, the dassies started having babies, but each litter died. Michele and Ian discovered bite marks on the dead babies, and realized that the big males were killing the newborns. They suspected captivity had something to do with it. They opened the gates to the enclosure, and chased the dassies out. The dassies would eventually settle among the rocky outcrops peppered across the Daktari property. 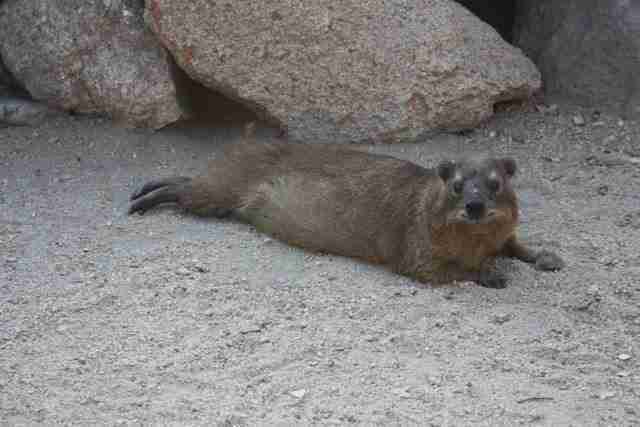 When the Merrifields started cleaning the dassies' former enclosure, they found baby Cachou tucked inside a tunnel made of earth and stone. He was dehydrated and thin, and only a few days old. Michele and Ian had never raised a baby dassie before, but they tried their best for Cachou, feeding him warm milk until he could handle solids. 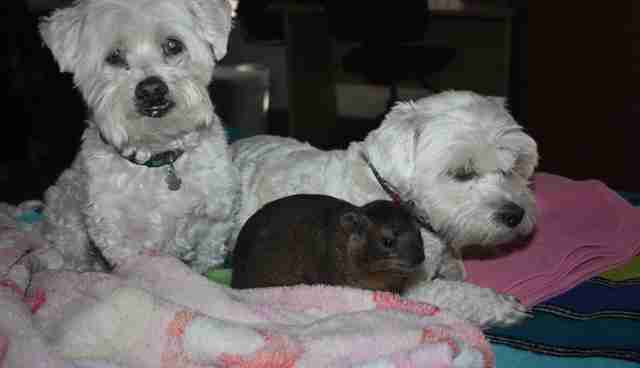 Cachou was surprisingly friendly and loving, and he'd sleep on Michele and Ian's bed, along with their three little white dogs, Candy, Bouba and Mr. Gucci Bijou. 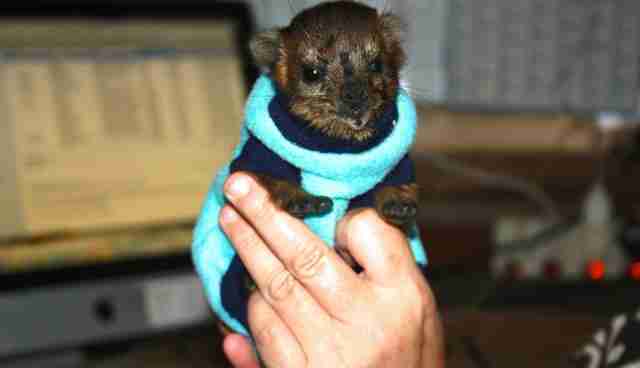 But as Cachou got older, he became less like a quokka (which, of course, he never was in the first place) and more like a dassie. "Cachou was very loyal, but only to me and Michele," Ian tells The Dodo. "He started to 'terrorize' the volunteers, growling at them when they came too close to him. 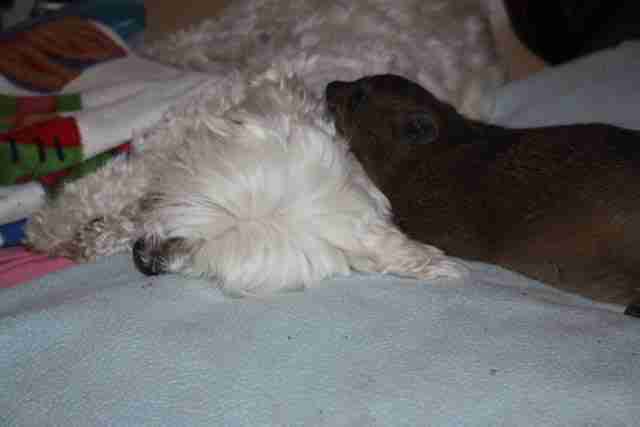 He even bit one - quite badly. He seemed to like terrorizing certain individuals. He'd wait outside their chalet, curl his lips up and growl at them. They were too scared to come out! When his lips curled up, it almost looked like he was smirking." Since Daktari accommodated school groups, the Merrifields realized Cachou was becoming a hazard. Michele started taking Cahou for walks to the rocky outcrops, hoping he'd choose to remain in the wild. 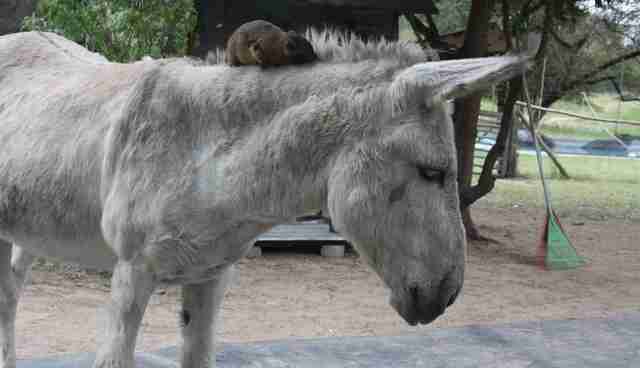 He'd stay away for a few days, and get to know the wild dassies, but Cachou would always find his way back to the main camp and continue his terror antics. 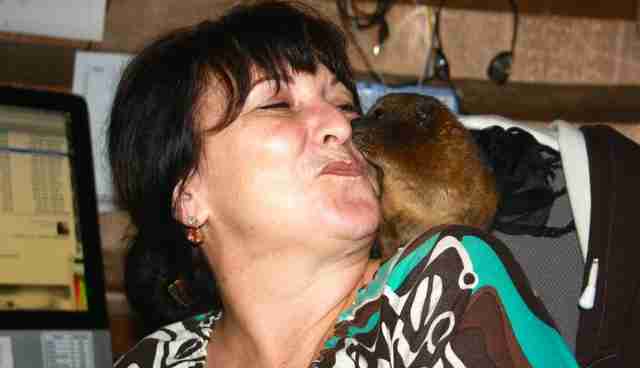 Eventually Michele and Ian drove Cachou a location several miles away where other dassies lived. 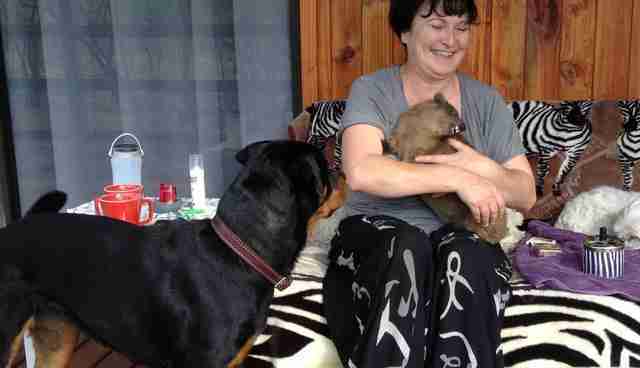 "We left him there with food and water," says Ian. "He's stayed there ever since. Michele or one of our staff, Willington, go there regularly and leave food and water for them. 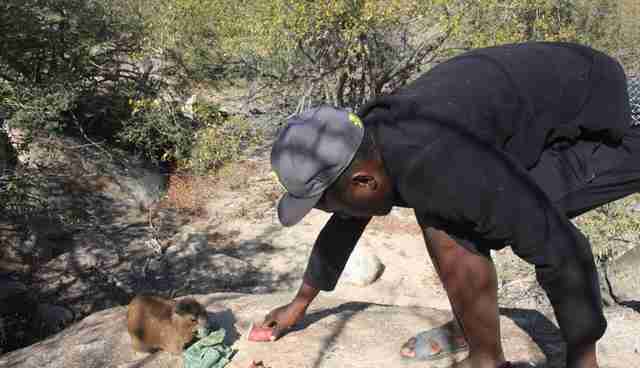 As soon as he hears Michele or Willington, he comes running to say hello, whereas the other dassies disappear in the cracks of the rocks. This continues to this day!" Cachou was hand-raised, and partially dependent on people, which is why the Merrifields have supplemented his diet. South Africa is also going through a terrible drought, and many landowners are putting food out to help keep wildlife alive. In normal circumstances, however, you shouldn't feed wildlife. Daktari relies on public donations to run their bush school and wildlife orphanage. You can support Daktari by donating here. 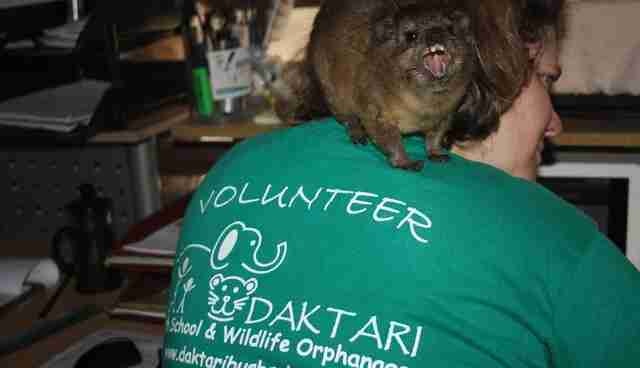 If you want to get more involved with Daktari, you can volunteer as a caretaker and teacher. Find more information about Daktari's volunteer program here.